Goaltender Marc-Andre Fleury has a history of bouncing back remarkably following tough outings. On Wednesday night, Fleury was pulled in the first minute of the second period after misplaying a puck behind the net and surrendering his third goal against to the Toronto Maple Leafs. Two days later against Tampa Bay, Fleury continued his trend of rebounding. He made 21 saves to record his 26th career shutout and third this season in a 3-0 Pittsburgh blanking of the Lightning Friday night at Tampa Bay Times Forum. Fleury, who turned 29 years old yesterday, was particularly strong in the second period. He made a brilliant stop, getting his paddle down, on Nikita Kucherov on a breakaway after the Russian forward split the Penguins defense. Fleury also got a toe on a shot from Alex Killorn and stoned J.T. Brown from the slot. Fleury made his most clutch stop on Richard Panik, who was alone in the slot, right as the second period buzzer sounded to end the frame. Fleury also has a history of missing shutouts by one goal. However, he was able to secure the goose egg against the Lightning. Team Canada brass might want to take notice. Forward Chris Kunitz should have your attention by now. The Penguins forward and Olympic hopeful recorded two goals for the Penguins against the Lightning to give him a team-best (tied) 13 on the season. Kunitz started the game’s scoring by finishing off a beautiful tic-tac-toe play on an offensive zone entry rush. Crosby made a brilliant pass through a host of players and onto Kunitz’s tape. 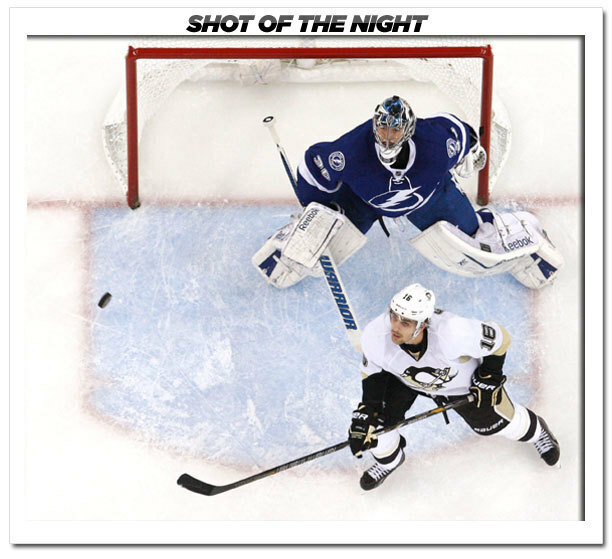 He finished the rest by snapping a shot over the uber-tall Ben Bishop. Kunitz added an empty-net goal at the end of the game to polish off the Bolts. The players are supposed to be given a warning by the officials and then on a second violation are given a two-minute penalty for delay of game. Malkin was penalized for such an occurrence in the second period. Sidney Crosby is no stranger to hitting milestones. He recently scored his 250th career NHL goal Nov. 22 vs. the New York Islanders. And he hit another career marker on Friday. Crosby set up Brandon Sutter’s third-period power-play goal to record his 700th career point in the NHL. He finished with three assists in the game and currently has 701 points. The Penguins power play continues to roll. Two days after scoring three man-advantage goals against Toronto, Pittsburgh connected for a huge power-play score in the third period to seal their 3-0 vicory. Sutter had the puck behind the net and tried to make a centering pass to Crosby in the slot, but the puck went off of Victor Hedman’s shin and bounced past Bishop for the score.